The Sheens seem to be patching it up. Now there’s no need to let holiday stress undermine an otherwise rocky marriage! Things aren’t working out so well for Tiger Woods. Though Brooke Mueller may be able to over look a little thing like alleged murder threats, Elin Woods was unable to overlook the hordes of women that her husband was keeping happy on the side. Their divorce is proceeding full steam ahead. you’re not just losing a wife, you’re losing lucrative corporate sponsorships! Tiger has lost another sponsor too! This time it’s AT&T. Perhaps they felt he didn’t mesh well with the ‘reach out and touch some one’ slogan, or he matched it too well. If we know anything about Tiger (and we already know more than we want to) it’s that he’s fit! His ‘workout’ routine was surprising! 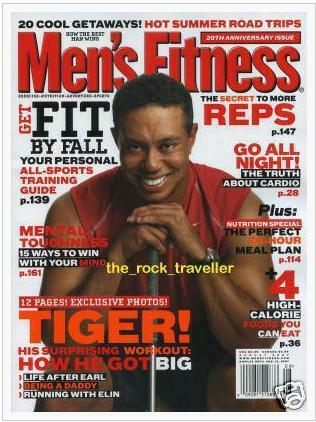 You can read more about Tiger Woods‘ misadventures @ Eat.Sleep.Celebrity! This time it involves a compromise of the National Enquirer’s ‘alleged’ journalistic ethics – I am so disappointed in them! They grow up so fast now! One day they’re an innocent child, and the next they’re checked into rehab with a 25 vicodin a day habit. When you’re stuck with a name like “Peaches Geldof” your chances of growing up normal must be about 1 000 000 to 1! In other news Angelina Jolie was recently photographed looking scrawnier than ever! In fact she’s beginning to look like Waylon Flowers’ Madame! From one ‘growing’ family to another? The show must go on, even if the players are expendable. With that in mind have a look at the replacements TLC has lined up for the Gosselins! The Gosselins are currently on hiatus, or in limbo. Maybe they’re just in tabloid hell. It might be their own fault (though they had many enablers). Celebs have a way of saying things that come back to bite them. 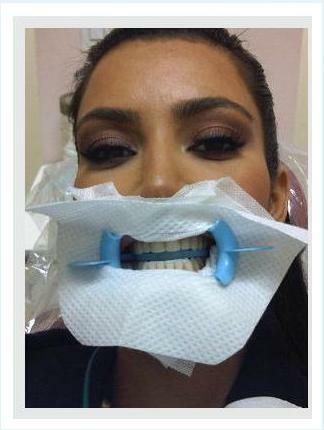 Kim Kardashian seems to have found a cure for that, in the form of an eye catching dental gag. Could this become a celebrity trend? We can only hope. From the looks of that pic I’m not sure whether she’s getting her teeth done, or getting ready to run the Kentucky Derby! For those of you who’d hoped we’d heard the last of the Palins, tough luck. Though their 15 mins should have run out long ago it looks like there’s still some time on the clock, as former high school hockey player, and former Palin family member Levi Johnson threatens to make the whole custody battle public. 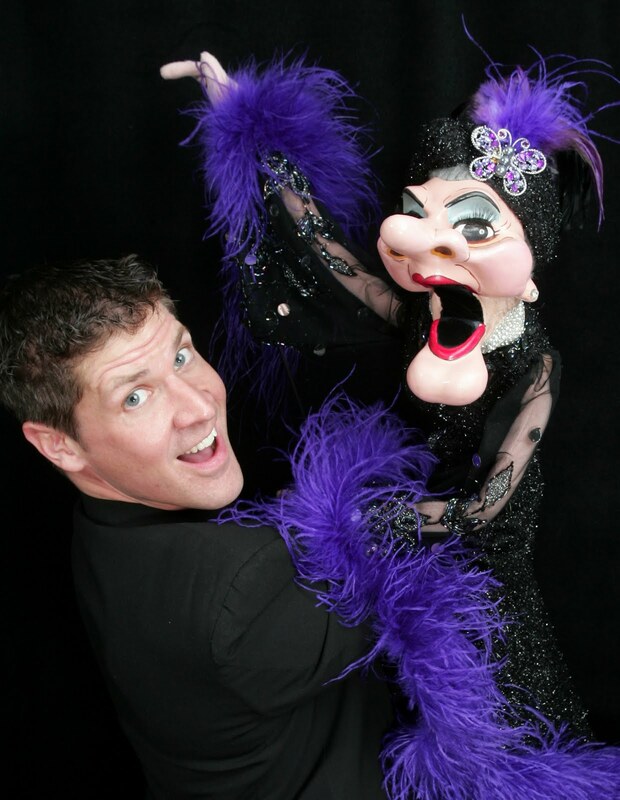 He claims that he’s afraid of Sarah Palin and her far reaching influence (she knows Oprah!). So he’s decided that his best defense is to wave his dirty laundry in our faces (Is that a good offense, or just offensive?). Just our luck. Then again you wouldn’t be reading this if you didn’t enjoy the occasional whiff of scandal! BTW – for those following the unfolding Sheen-Mueller case reports are conflicting: She recanted, she didn’t recant, she wants to reconcile, and she has a criminal history involving cocaine & DUI. Run Charlie, run! It seems that the only person able to find any good in this situation is Charlie’s vindictive ex wife Denise Richards! Now you just have to admire that kind of optimism. Charlie Sheen sure knows how to pick ’em! 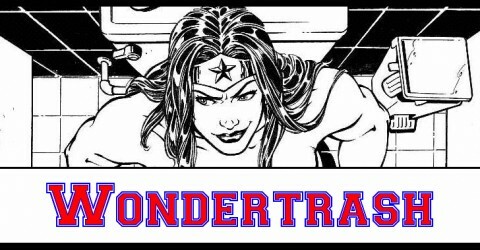 Wondertrash thought of the day: Remember that there are people worse off than you are, and many of them are rich & famous! If only we had known this before Christmas! That’s the good ole’ mainstream media – better late then never. There was one truly informative piece in the video: now you know you can buy boxes of human hair! I wonder which human hair they rate as best? Matches and gasoline: together again! Believe it or not, it’s being reported that troubled singer Amy Winehouse, and her troublesome ex Blake Civil-Fielder have had a ‘commitment ceremony’. Though some think that they’d be better off being committed to an institution, the pair are said to have had some sort of a ritual, involving vague promises and rambling vows sometime during Christmas. The proceedings took place near the rehab center where Blakie is currently being held. While most folk aren’t surprised by anything Winehouse might do (except pull herself together), this one is an eyebrow raiser, even on the Winehouse scale. Not only has Blakie admited to being the one who got her hooked on drugs, and who almost accidentally killed her by way of an over dose; but he also got hooked up with another woman during one of his numerous rehab stints. That resulted in a pregnancy, and more Civil-Fielder DNA floating around in the gene pool. It’s enough to undermine your faith in Charles Darwin – “What natural selection?” If Amy is prepared to over look that, then let’s the rest of us hope that Blake’s rehab love child got what ever good genes might have been available in that pairing up.